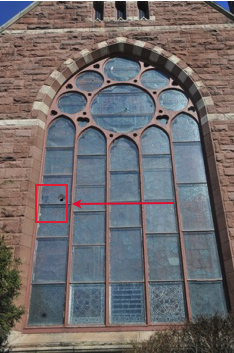 In March of 2011, the large multi-lancet window located in the front of The Newton Presbyterian Church, was victim of vandalism. 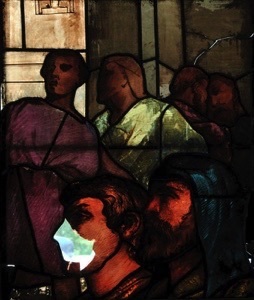 The large window depicting Paul preaching in Athens, was designed by stained glass artist, Donald McDonald in 1882, in memory of Dr. William Ellery Channing (April 7, 1780 – October 2, 1842). Dr. Channing was the foremost Unitarian preacher in the United States in the early nineteenth century and, along with Andrews Norton, one of Unitarianism's leading theologians. 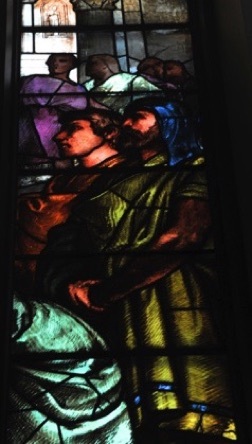 Rocks were thrown at the stained glass window, which was covered from the exterior with a textured clear glass. 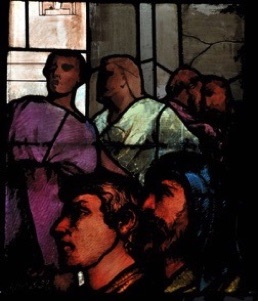 One section in particular was severely damaged, as the rock not only went through the exterior glass, but also through one of the stained glass panels, sending shards of the painted glass flying into the church’s sanctuary. I was called the following day to assess the damage. Members of the church and I stood under the window looking out through the large gap left by the rock on a beautifully painted face, trying to rationalize why someone would do such a thing. 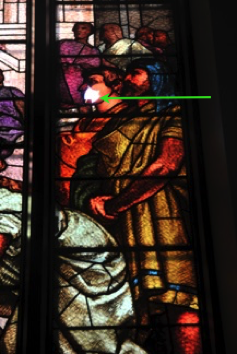 As I looked at the damaged face, I asked the members of the Church if any glass was retrieved. One gentleman replied: “Oh, yes, I came in this morning and found small pieces of glass strewn on the floor. I swept them up and put them in an envelope. They are probably too small to try to piece together, but I’ll be happy to show them to you”. 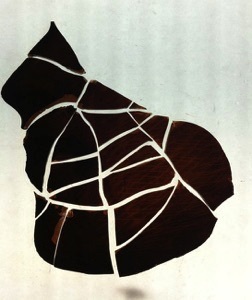 As I brought the pieces to our studio, I slowly and carefully tried to make sense of the shards over a light table. I was ecstatic when all the pieces lined up, with only one small section of about, ¼” x ½” missing. Within weeks, the damaged panel was removed and restoration began. 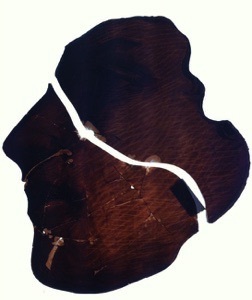 The damaged face was removed from the panel and laid on a light table. 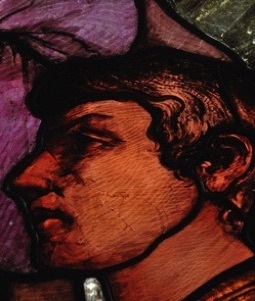 The damaged face was carefully edge-glued with Hxtal epoxy, tinted to match the base color of the glass. The repair took a few weeks as I pieced and glued a few shards at a time. After all pieces were glued together and the epoxy fully cured, the cracks were in-filled with artists’ oil paints. The repaired face was covered from the exterior with 2mm clear glass, and the interior of the face covered with thin non-glare conservation glass. The panel was reinstalled in its opening and new textured glass installed to the exterior.